TSI GADGET key finder (key tracker, key locator) helps to locate items you often lose. Attach the receiver to your keys, a remote, a purse, glasses, canes, umbrella etc. To use, simply push the colored-buttons on the remote control and follow the audio beep sound attached to the receiver. The sound will help locate your lost item(s) with a range of up to 30 meters away. The receivers comes with red LED light (a handy feature when looking for your items in the dark) as well as a remote stand. SOUND & LIGHT: receiver sounds/beeps, leading you to your lost item. The remote control and receivers are equipped with a light for better night visibility when locating the items. EASY TO INSTALL: Comes with 6 rings, 6 double sided tape and mount for the transmitter so you know exactly where it is when you need it. The key finder (receivers) can be attached to key, mobile phone, wallet and luggage, etc. almost all the important items. It's feasible and practical in personal life and work. 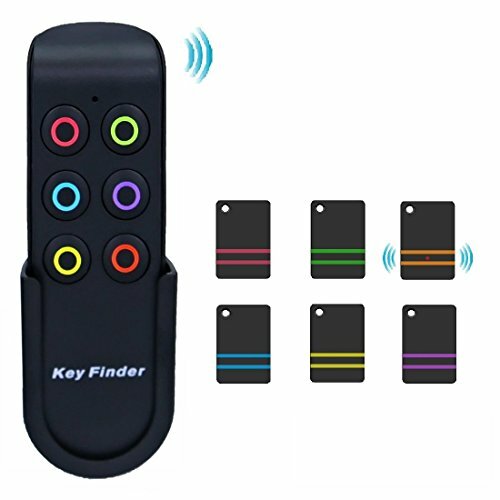 ONE KEY CALLING, SIMPLE TO OPERATE: With just one press on the button of the transmitter, the beep sound from the key finder(receiver) will lead you to locate and find the lost item. If you have any questions about this product by TSI GADGET, contact us by completing and submitting the form below. If you are looking for a specif part number, please include it with your message.